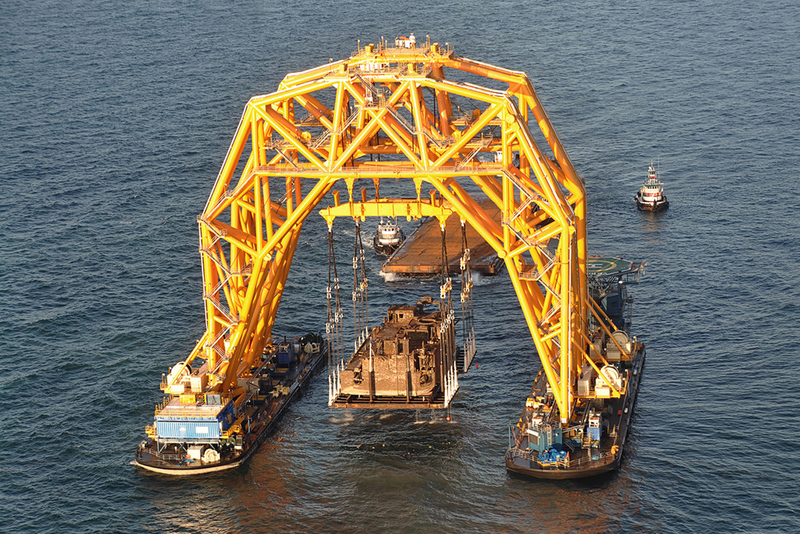 VB 10000 was designed by Versabar to meet a growing demand for offshore salvage operations. Over the last 3 seasons, this 25-storey monster has successfully completed many recovery projects with world's leading oil corporations, which we're assuming has more than paid it off. 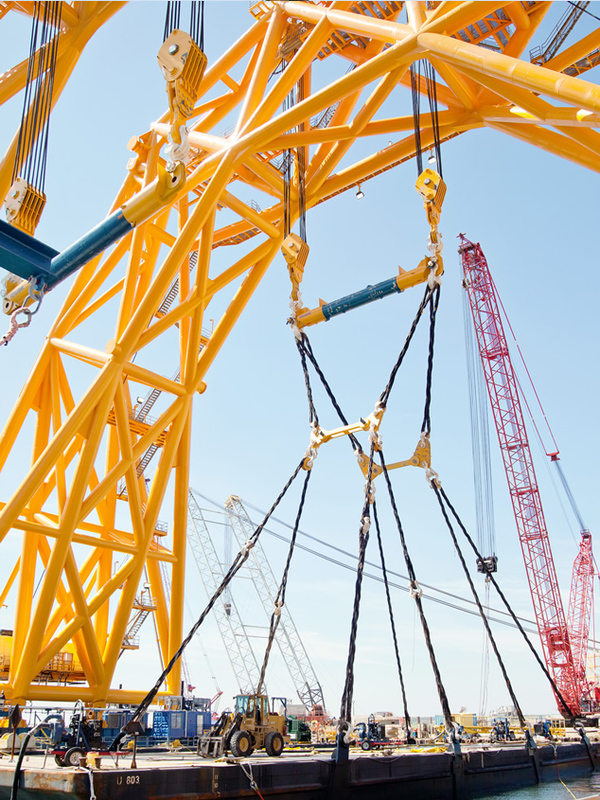 Check out some photos and a video of this "crane" in action. Some of you might be asking: "Why would anyone come up with something so huge?" Well consider this. It takes a team of divers several months to cut apart a downed oil platform, lift it up to the surface piece-by-piece, and transport to land. VB 10000 can to the same task in just a few hours and for a quarter of the price. "Until Khachaturian got into the business, salvage and removal was not just expensive, it was dangerous. 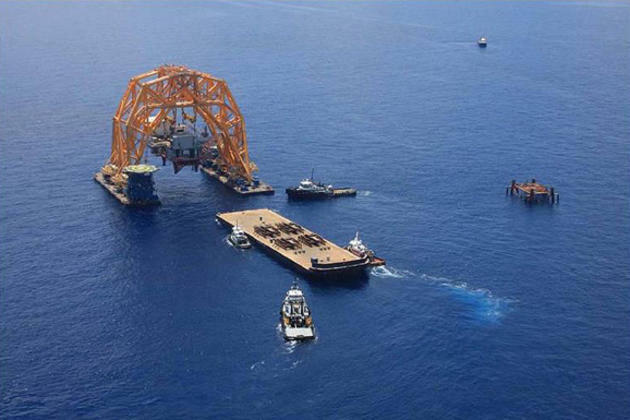 Divers at depths of up to 500 feet had to hack the rigs into pieces small enough to be removed using conventional derricks. 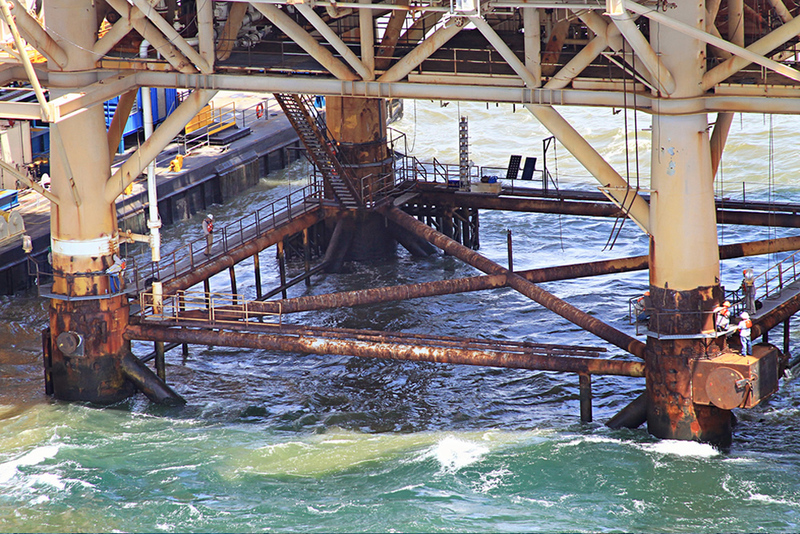 A gas pocket ignites, a diver exceeds his time limit, or a section of the rig falls in an unexpected direction when it’s cut free, and somebody dies. (A massive manta ray once incapacitated a diver hundreds of feet down.) Those jobs take months. 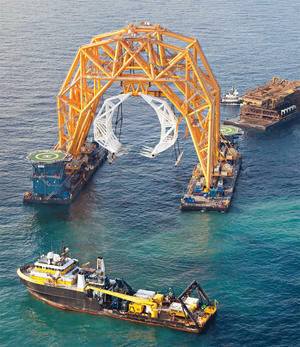 So Khachaturian built the VB10000, a 25-story arched truss on top of two 72-by-300-foot barges [see “Monster Crane,” page 63]. The VB10000 can pull out an entire rig in a day, at one fourth the cost of a traditional salvage job." 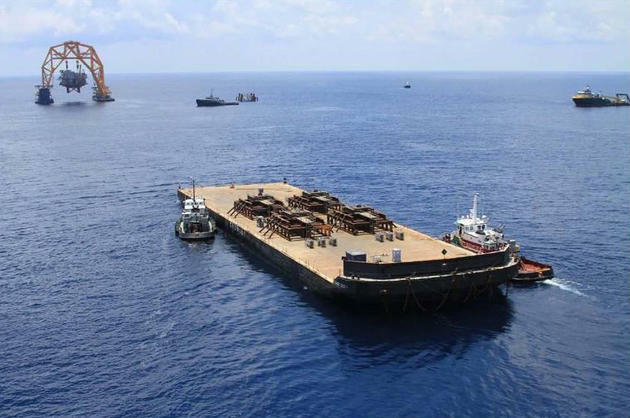 "In the past year, Khachaturian’s monster has removed 30 platforms and salvaged roughly 70 in pieces. 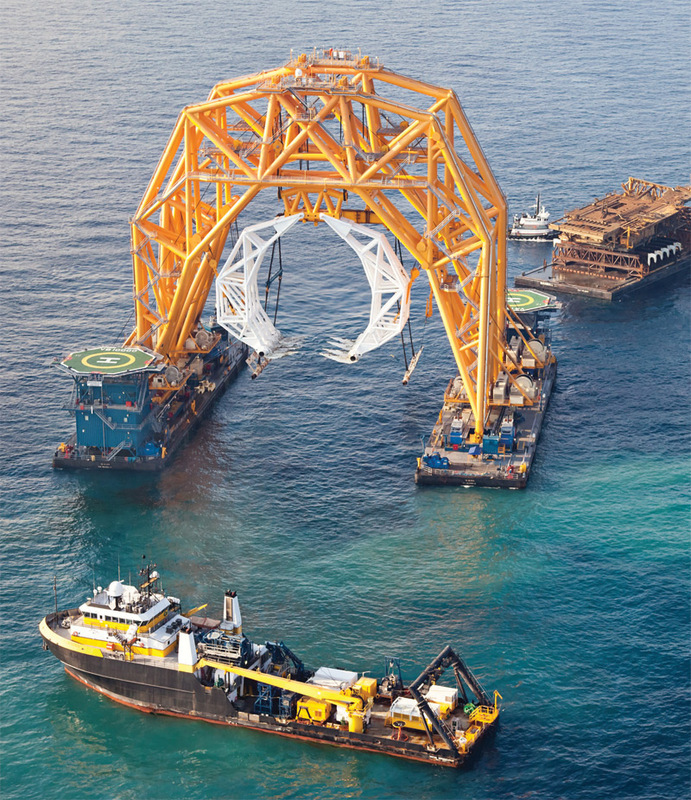 Another 25 sunken rigs are on the to-do list. And Khachaturian isn’t convinced that we’ve even seen a 100-year storm yet. 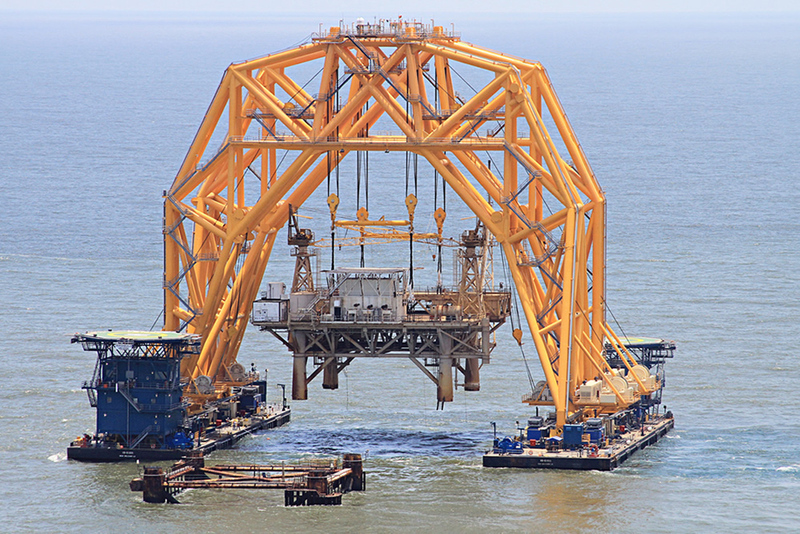 There are approximately 7,000 rigs operating in the Gulf of Mexico. They will all be retired eventually—if nature doesn’t get to them first." This post has been viewed 34,248 times. 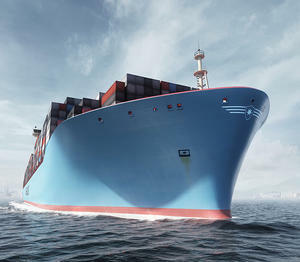 The construction of ten Triple-E vessels, each capable of carrying 18,000 twenty foot containers, will put Maersk Line at the helm of change. The size and capacity of these vessels, at 400 metres long and 59 metres wide, will help reduce energy consumption and lower CO2 emissions. – John Wooden, an American basketball player and coach.